Whether you are an experienced dog owner or a first-timer, the first few months with any new puppy can be a real rollercoaster. Here, the owners of Hoover and Jelske’s seven puppies, share their ups and downs of owning a Stabyhoun. Nothing could have prepared us for the joy and laughter Mac has brought to our lives. He arrived like a whirlwind into a household of four other dogs. His enthusiasm for everything is insatiable. He has stolen the hearts of so many people who have met him. Mac is viewed firstly with curiosity which soon turns into admiration for the calm and thoughtful way he approaches life. He has accepted with great enthusiasm all the challenges we have presented him with, and so far he appears to be unflappable. He plays hard and his stamina is to be admired; not to mention his determination. He has shown a wonderful and sensitive side to his nature when playing with young children and recently showed real concern when a friend was upset one day; putting his head onto her lap. His capacity to love knows no bounds. He has developed a strong emotional attachment to each of the four dogs he lives with and to my husband, myself, our family and friends. His love of people is without discrimination; he simply views everyone he meets as an object of joy and greets them as if they were his long lost friends. In essence, he is hard to fault. Mac recently blew me away when he displayed his ability to pick up a scent. We were meeting up with a friend and her dog who had arrived first on the walk we were planning together. I took Mac out of the car and opened the gate into the field. In spite of my friend and her dog being out of sight over the brow of the hill, Mac picked up on their scent immediately. His enthusiasm and excitement when he did was wonderful to see; I let him off the lead and he took off at great speed to go and find them! I have no doubt whatsoever that Mac will be able to do anything we ask of him and that is incredibly rewarding. Without a doubt the biggest challenge was the first four to six weeks. He was obsessed with the other dogs in the household and extremely determined to play with them, showing incredible stamina for such a young puppy. His nipping and biting at this age was also quite hard. I soon learnt that I had to match or indeed exceed his determination when showing him what is acceptable behaviour and what is just plain naughty. 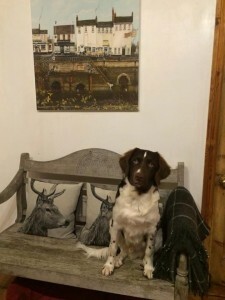 People usually assume he is a Springer Spaniel or Springer cross when they first meet him. But everyone is then completely taken with his friendliness and enthusiasm. In a working capacity people have been impressed by his calm and pensive nature – commenting that they forget how young he is because of his steadiness. He has been a great ambassador for the breed, so much so that my friend is hoping to have a daughter of Mac one day! Day 1: Exciting and nerve wracking – after much anticipation, finally we could bring our little boy home after two years of waiting for the right time and the right dog. We were a little nervous about how Emo would settle in with Ben and all the other animals, but he was just so sweet and lovely. We were so happy that he was home. Week 1: Exciting and nerve wracking and totally exhausting – our little boy was amazing and gorgeous, but it was hard work getting him settled in. Ben had to adapt to not getting 100% of my attention – suddenly, a little furry creature was taking up a significant proportion of it. We had a little sibling rivalry to manage and, as a new dog owner, the reality and huge responsibility of bringing up a well-behaved, happy little pup hit home. Month 1: Exhausting, fun, rewarding. Ben says, “really cuddly”. By now, Emo was settling into a really good routine and was amazingly well behaved – an absolute dream to house train, with only a few accidents. After a few false starts (thanks Christina for constant moral support), he quickly got into sleeping through the night too. Most of all, we found him to grow rapidly into a brilliant, fun, new member of the family who was always up for a cuddle and a play. Since then: Emo has learned everything I’ve attempted to teach him straight away. These days, he now usually chooses to do what he’s told! But I’m so proud of him and, although there are frustrating periods when he just won’t listen to me, we come out happier and more confident after working on it and negotiating our way through each particular issue as it comes up. We’re now feeling like a proper little family of three 🙂 Emo is still a stubborn little soul at times, but more than makes up for it with love, cuddles and companionship. The first 100 days have been a massive and very rewarding learning curve for all of us. Ben says: “Playing with him, with a super cool new toy,” has been the most fun. For me, it is exploring a new place that neither of us have been before and watching Emo’s excitement as he sniffs all the new smells. The biggest challenge has been trying to get Ben and Emo to play with each other without Emo nipping and jumping on Ben’s head. They love each other dearly, but trying to reign the pair of them in when they are playing so that they don’t upset each other has proven difficult. Ben and Emo are both very similar in character: Full on, full of fun, very stubborn and incredibly resilient. Luckily, upsets between them never last long and Emo is ever so good at saying sorry in his own licky way. People love how soft and silky his coat is, and how gentle and calm he is by comparison to most Spaniels, which is what they think he is. They are very surprised when they find out that he’s just a puppy and a rare Dutch breed at that. When he was smaller, people often mistook him for a young Newfoundland pup, but now they assume he’s a grown-up Springer and when they ask his age, are impressed with how relatively sensible he is for such a young ‘un. People with kids who are otherwise scared of dogs are surprised at how their children seem to take to him, when normally they would run away. Those with older dogs that are normally reluctant to engage with fellow canines are surprised at how easily Emo manages to coax them into playing with him. We can’t remember what life was like before we had her; she is such an established member of our family. Wilma is starting to look like a grown up dog rather than a puppy – she really reminds us of Jelske too. She is an extremely loyal dog and shares her love and affection equally between Jim and I. But when family and friends visit, we don’t get a look in! She makes everyone feel welcome and they all leave wanting to take her with them! Challenges are few and far between now. In the early days she hated getting into the car and going to bed – she is now much better at both. She is not fazed by any sudden noises and is very calm most of the time. We take her to puppy training every Saturday morning and she learns very quickly. Recall is not fully established as she will always choose to play with another dog over coming back to us. Who can blame her – they’re much more fun. Wilma is very sociable with other dogs and is learning to keep her distance from the grumpy older ones we encounter sometimes on our walks. She adores children and is always very gentle when they come near to say hello. She has numerous funny habits and often has us in stitches. When she wants attention she will ‘hunt’ out things she knows she can’t have and deposit them at our feet as if to say ‘if you don’t play with me I am going to do serious damage’! When she wants to be fed she either barks at her bowl or carries it through to us – NOT very subtle! When she wants to go for a walk, she picks up one of Jim’s [heavy] walking boots and plonks it at his feet. Wilma loves socks and stealing from the wash basket; her favourite game is to play chase around the coffee table. I know Jim spent ages finding the ‘perfect’ breed for us, but he was spot on. 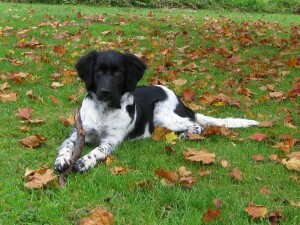 Our little Stabyhoun is absolutely wonderful; a perfect representative of the breed. We love the fact that she is mischievous and occasionally stubborn and wilful, but in her heart she loves to please. Everyone who has met Wilma remarks firstly on how beautiful she is and then on how calm she is for such a young dog. They always want to know more about the breed. I guess that makes her the perfect ambassador. Both Jim and I know that the main reason Wilma is developing so wonderfully is due to the amazing start Christina gave her and her siblings. For that we are truly grateful. One word, wonderful! He is amazing, gentle, loyal and full of beans and as his full character unfolds he makes us smile on a daily basis with his funny little antics. The most fun is hard to narrow down but under careful consideration it must be seeing our children and Helmer running through the woods without a care in the world. As for our biggest challenge it has to be discouraging jumping up at our kids, friends and random strangers when we are out. 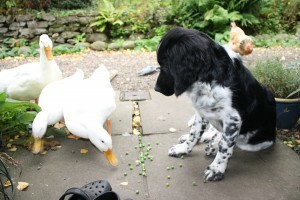 It is almost under control but strong controlled management is still required when Max and Freya have friends around. We knew this would be an area that could potentially be tricky with two young children. Anyone who has met Helmer has instantly had a soft spot for him and also commented on his obedience. Friends have looked after him for a weekend and were very keen to babysit for longer, which says it all! What a joy! We have never had such an easy and intelligent pup. Oh don’t get me wrong she is very definitely a pup and we have all the unnecessary bills to prove it. Nothing that quite hit the excess on household insurance but she’s been as costly as any of her predecessors, and possibly then some. But worth every penny. We were once told that the Stabyhoun was a sensitive breed but neither of us believed it. Blijke Buckley seemed to be the least sensitive puppy we had ever had. How foolish of us not to trust the words of the wise! Over the last 100 days we have watched all facets of her personality come to the fore, and yes she is a sensitive little soul who can be easily hurt. But with that said, there’s a healthy chunk of bravado and stubbornness mixed in to round-off this wonderful breed’s personality. The biggest challenge for us has been integrating her with our other dogs. Blijke received a mixed reception initially, from ‘love at first sight’ to ‘talk to the hand’. When you have an adorable pup demanding your attention you have to find ways to make sure the other dogs are receiving the time and attention that they are accustomed to, and need. People who meet Blijke for the first time are amazed at her maturity for a puppy. They love the look of the breed and always comment on her human eyes. We in turn explain how many hoops you need to jump through to get one which soon sorts the ‘wheat from the chaff’. She’s a dog that brings joy and fun into your life with no effort whatsoever. We definitely enjoy higher levels of serotonin in this household since the 4th of July! In short: She has been an absolute joy and a fantastic addition to our eclectic mix of dogs. We look forward to many more milestones with the joy that is ‘Blijke Boo’! The last 100 days have been a roller coaster ride – all the build up to getting a puppy and her final arrival! It has been an amazing experience with both highs and lows. Never having had a puppy of my own before, I found it difficult to relax and trawled through books about what to do and what not to do. I later learnt that relaxing more and enjoying her instead was the thing to do. Having spent my life being able to do what I wanted when I wanted, adapting to having a puppy in my life has been a big challenge. But I have loved watching her grow and seeing her personality develop. She follows me everywhere and is such a lively inquisitive puppy…nose into everything including plants, loo, shower! I have watched her grow from a little podgy puppy into a leggy, shiny coated, coiled spring. It is safe to say that my life has changed completely. It has been a joy to see how quickly she learns, but having said that, it doesn’t mean that she is obedient! One thing I know for sure is that she has a great sense of humour and never stops sniffing out trails, playing games and teasing me. She seems to have little fear and is game for anything. Despite her young age, Pip has already been swimming in a nearby loch. She loves children and other dogs, and of course adults. This is a puppy that is full on, all day. In the evening, being tired, she is so gentle and loves to lie on my knee with her head on my shoulder. Sometimes it’s hard to believe that she is the same puppy as daytime Pip! One of the biggest challenges has been to get her to stay in her crate alone. She still barks for a while before settling down so we have to keep working on it. I guess there comes the stubbornness again. Pip won the first trophy at puppy class for being the best puppy to sit when asked. Then, a month or so later, she would only sit when she felt inclined! This girl certainly attracts attention and interest wherever she goes. 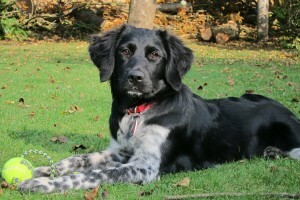 Some have knowledge of similar breeds, if not the Stabyhoun. And they all want to pat her and then remark on her lovely shiny coat plus how fit she looks. 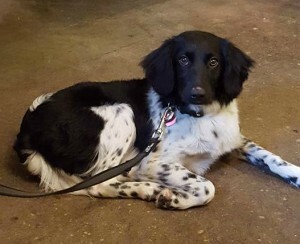 A couple of people have asked for more details of the breed so who knows; maybe there will be more Stabyhoun in Scotland in the future. Fun/tiring/entertaining/touching. Blijke has been a super star. She has fitted into the family very well; is naturally calm and sweet-natured, and takes everything in her stride. Blijke has good manners with other dogs and with people, except for jumping up! The best bits have been spending more time outside as a family. And it is great to whistle and see her come running towards us – she is brilliant at recall. Blijke is very affectionate and we have all had lots of Blijke cuddles. She leans in to you in such a lovely way. And seeing Blijke playing with her dog friends is great too; hugely frenzied and energetic. She pretty much house trained herself when she arrived; we hardly had to do any work so that was a success too! We have struggled a bit with getting her used to spending periods of time on her own; I think that is sorted now. And the ongoing challenge is teaching her not to jump up at people – she wants to lick everyone’s face! Everyone admires her colouring; her spotty legs and pretty face especially. 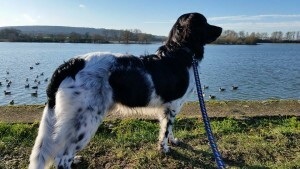 Lots of people ask if she is a Springer cross, but then say that they will look up the breed as soon as they get home. Several of my friends are thinking of applying for a Stabyhoun. One of them already has! 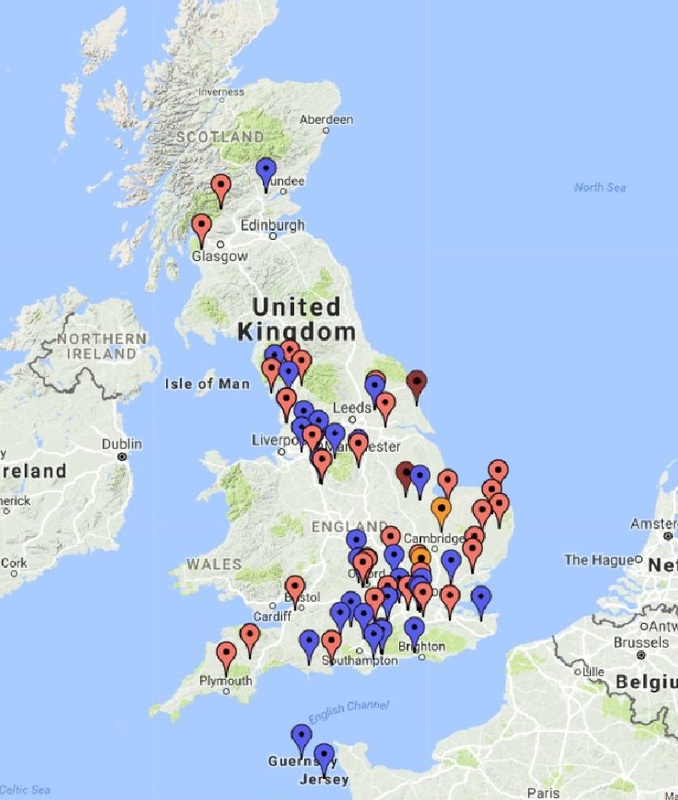 A huge thank you to Ursula Linfoot, Cathy Hawes, Frances Godfrey, Lene Manners, Sylvia Buckley, Vicky Jack and Claire Harrington for sharing their first 100 days with a Stabyhoun puppy.